...basking under my yellow sky...: Hiroshima - 65 years later - Today! Hiroshima - 65 years later - Today! The dropping of the first atomic bomb nicknamed ''Little Boy'' at the time was a deliberately exclusive mission assigned to just three U.S. planes which carried the ordnance the morning of this historic day. Those closest to the explosion died instantly, their bodies turned to black char. Nearby birds burst into flames in mid-air, and dry, combustible materials such as paper instantly ignited as far away as 6,400 feet from ground zero. The blast wave followed almost instantly for those close-in, often knocking them from their feet. Those that were indoors were usually spared the flash burns, but flying glass from broken windows filled most rooms, and all but the very strongest structures collapsed. Within minutes 9 out of 10 people half a mile or less from ground zero were dead. The firestorm that later erupted took care of the lives that were still remaining. As if that wasn't enough, long term effects were the likes of cancer & radio-active poisoning all in due time shortening the lives of these victims. 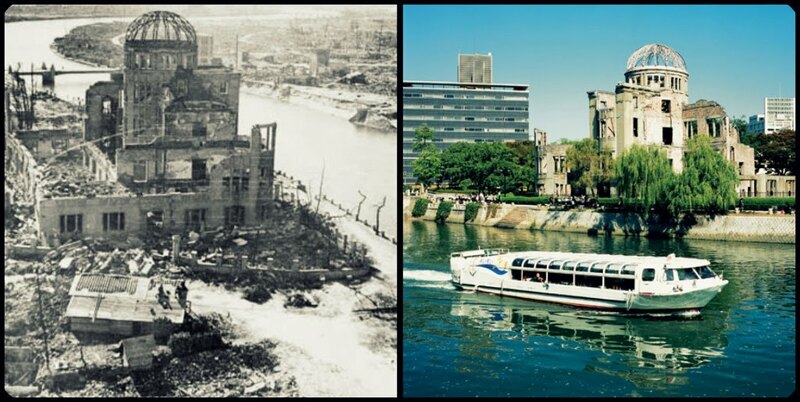 The surviving victims of the bombings are called Hibakusha, a Japanese word that literally translates to "explosion-affected people." 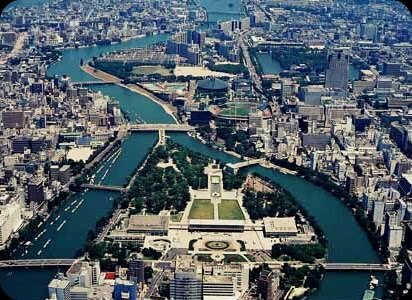 This lies in the center of Hiroshima, Japan. It is dedicated to the legacy of Hiroshima as the first city in the world to suffer a nuclear attack, and to the memories of the bomb's direct and indirect victims. It is the skeletal ruins of the former Industrial Promotion Hall. It miraculously survived the 1945 blast despite being only metres from the hypocentre. It was left how it was after the bombing in memory of the casualties. 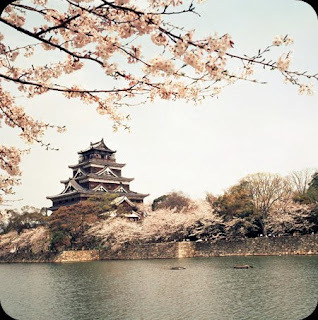 Originally constructed in the 1590s, the castle was destroyed in the atomic bombing in 1945. It was rebuilt in 1958, a replica of the original which now serves as a museum of Hiroshima's history prior to World War. In the company of hibakusha who, on this day 65 years ago, were hurled, without understanding why, into a "hell" beyond their most terrifying nightmares and yet somehow managed to survive; together with the many souls that fell victim to unwarranted death, we greet this Aug. 6 with re-energized determination that, "No one else should ever have to suffer such horror." 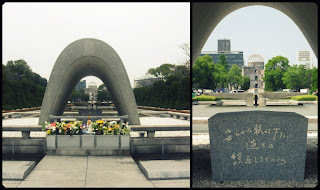 In accordance with the Hiroshima Appeal adopted during last week's Hiroshima Conference for the Total Abolition of Nuclear Weapons by 2020, we will work closely with like-minded nations, NGOs, and the U.N. itself to generate an ever-larger tidal wave of demand for a world free of nuclear weapons by 2020. 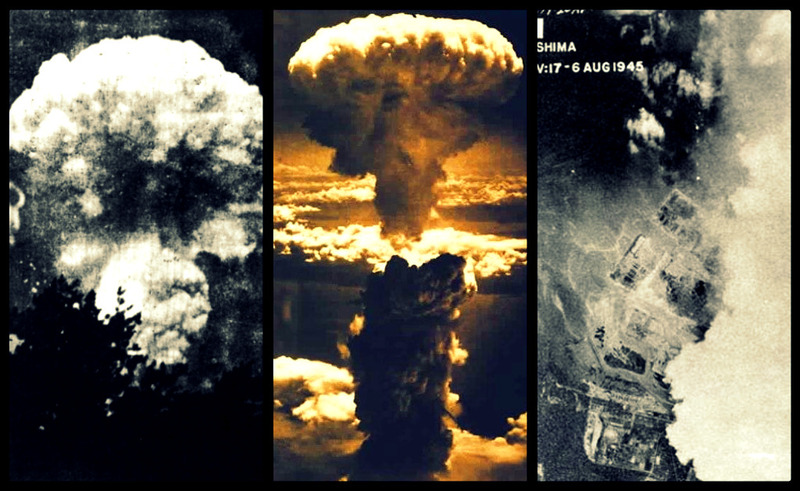 On this, the 65th anniversary of the atomic bombing, as we offer to the souls of the A-bomb victims our heartfelt condolences, we hereby declare that we cannot force the most patiently enduring people in the world, the hibakusha, to be patient any longer. 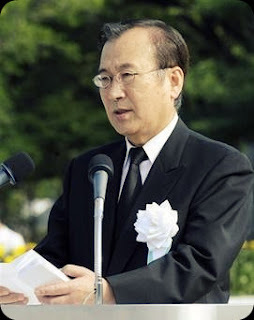 Now is the time to devote ourselves unreservedly to the most crucial duty facing the human family, to give the hibakusha, within their lifetimes, the nuclear-weapon-free world that will make them blissfully exclaim, "I'm so happy I lived to see this day."